I’m delighted to be working with state folklorist Maggie Holtzberg in Lowell this summer. 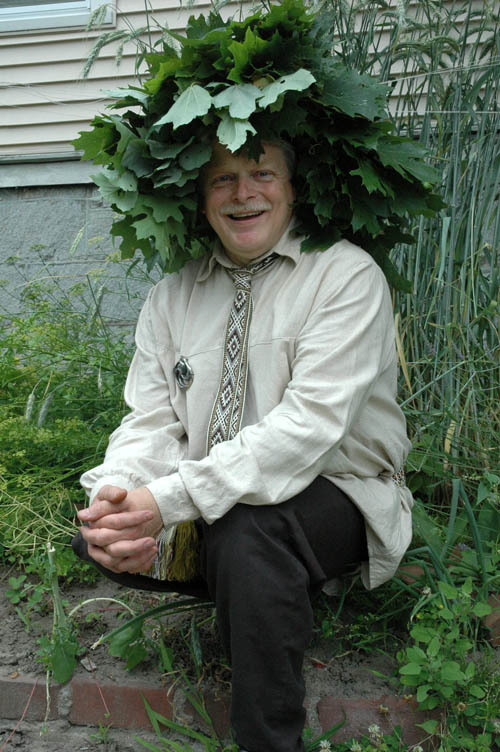 On the summer solstice, Maggie and I went to visit Jonas Stundzia at his home in Lawrence to learn about Rasos Svente, the Dew Festival, and the ways Lithuanians celebrate the longest day of the year. 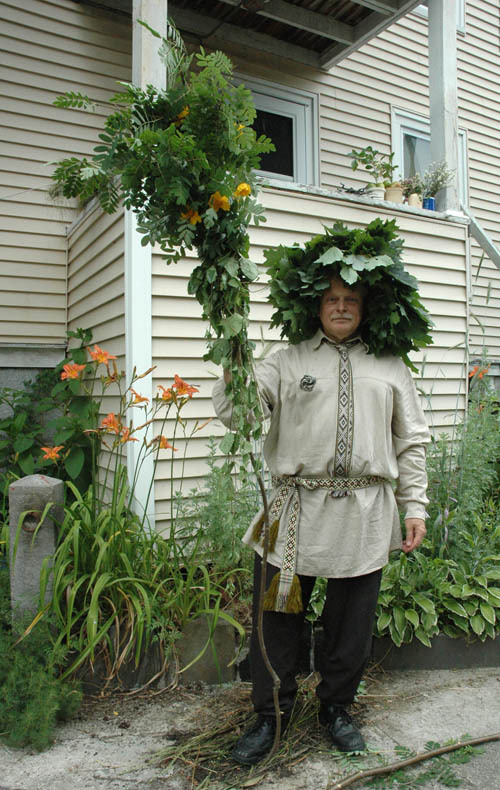 He will be demonstrating how to make floral head garlands at this year’s Lowell Folk Festival. Garlands, or wreaths, are an important part of this solstice festival, also known as the festival of Saint John. Jonas is a wealth of folklore. When we got to his house, he welcomed us with a traditional Lithuanian greeting. 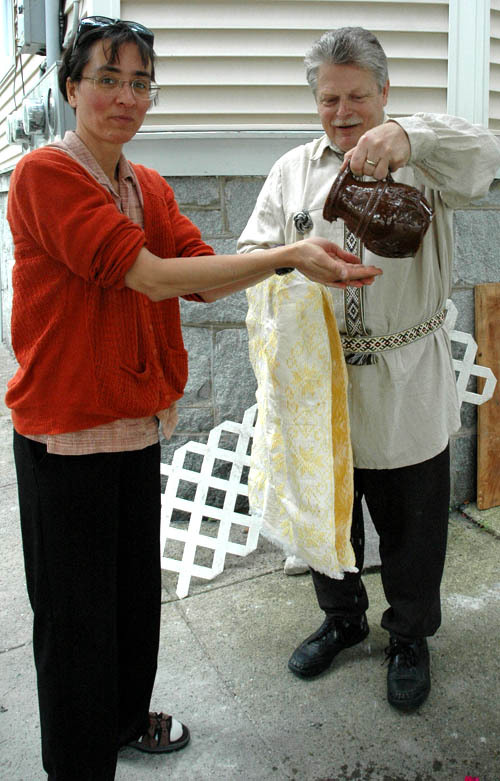 From a decorative ceramic pitcher, he poured water over our hands, and held out a woven Lithuanian cloth to dry them. He then offered us cucumbers dipped in honey and small cups of samagonas (rye moonshine). He said that cucumbers dipped in honey are eaten as a summer treat only in the northeast area of Lithuania. Jonas showed us his garden blooming with plants native to Lithuania, including wild sorrel, used in making soup; ruta (rue), the national flower; wild onions; and lavender. His garden also had winter rye, used for Christmas decorations; parsley; mint; wild straw; and wild dahlia. He showed us a large oak garland he had made. Oak is considered a male tree and oak garlands are usually reserved for men. We tried it on anyway, and it was heavy! 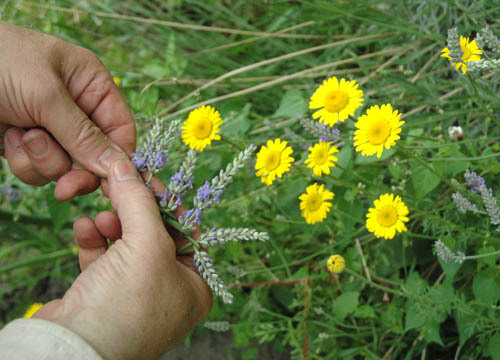 In Lithuania, garlands made of wild flowers, healing herbs, and grasses are used in the solstice festival to adorn the head, decorate the homestead, float candles on the water, and burn in the bonfire. Jonas had made another large circular garland with linden and yellow flowers which symbolize the sun. 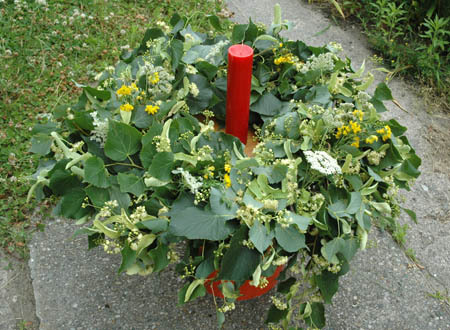 Lithuanians consider linden a female plant; this wreath could be worn by a woman, or decorated with lit candles to be floated on the water on the evening of the Rasos Svente festival. The points of light guide the sun back home to earth. Wreaths symbolize the circle of life. Circles and wheels are important in Lithuanian mythology. In one pre-Bronze age myth the sun travels across the sky pulled by a goat. Jonas told us that Lithuanian rituals and language go back to proto Indo-European times. They still survive today because Lithuania was geographically isolated far up north on swampy land that nobody else wanted. Lithuanian is an ancient language, but still living, unlike Sanskrit or Latin. On the summer solstice, Lithuanians give kupole staffs to friends and neighbors to protect and bless their homes. Jonas showed us a kupole staff he had made with healing herbs: nettle (good for healing arthritis and a relaxation); wormwood (good for the nerves); southern wort (a nerve relaxant used to make absinthe liquor); mountain ash (considered a male plant, used in the celebration of St. John); and belladonna (a medicinal nightshade). 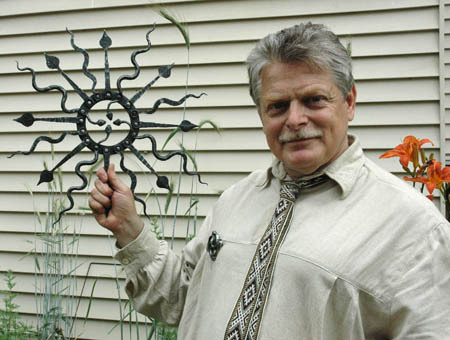 Next, he showed us decorative iron saule, which means “sun.” One had a circle, which represents the sun; branches which represent the tree of life; jagged thunderbolts; curved snakes; and roots representing the earth. In Lithuania, snakes are symbols of life. Gyvate means snake; gyvas means life. The first animals to appear from Mother Earth in the spring are the toad and the snake. Thunderbolts allude to the god of thunder who creates rain, and therefore gives life. Other saule he showed us had Christian crosses. He said that Roman Catholics had adopted and reinterpreted the form of the saule and used them in cemeteries to decorate gravestones. In the same way, the pre-Christian kupole staff transformed into a similar, but smaller and more compact staff used on Palm Sunday. The rituals of the Rasos Svente festival also were adopted into Saint John’s Day celebrations. We look forward to hearing more of his stories at his demonstration tent at the folk festival in July. All photos by Maggie Holtzberg.